Advanced, solid state LED and CCD diameter measurement for high speed applications. 15, 30, 60 and 200mm diameter models available. 2 and 3-axis models available. 5 and 12.5kHz scan rate models available. Solid-state design for maximum reliability and MTBF. Optional integrated PI feedback controller for driving insulation extruders or capstan drives. Optional Single Measurement Flaw Detection (SMFD) for detection of lump and neck flaws at intermediate line speeds (< 500m/min). Production line control and flaw detection integrated in a single package. Wire and cable insulation extrusion lines. Pipe, hose and tubing extrusion lines. Classic, scanning-laser diameter measurement with a proven application track-record. 30, 60 and 130mm diameter models available. 1 and 2-axis models available. 600Hz scan rate per axis. Integrates seamlessly with Proton Products CS range of Production Line Control systems for control of extruders and capstan drives in wire insulation production lines. Scanning-laser bench gauge for off-line diameter measurement applications. 30, 60 and 100mm diameter models available. Fast, non-contact replacement for vernier calipers and micrometer screw gauges. Readily interfaces to PCs via RS-232 for data logging and report production. 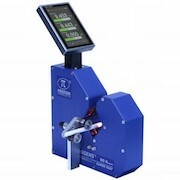 Available with optional V-blocks or rotary chucks for sample holding. Incoming inspection, quality assurance and laboratory use.